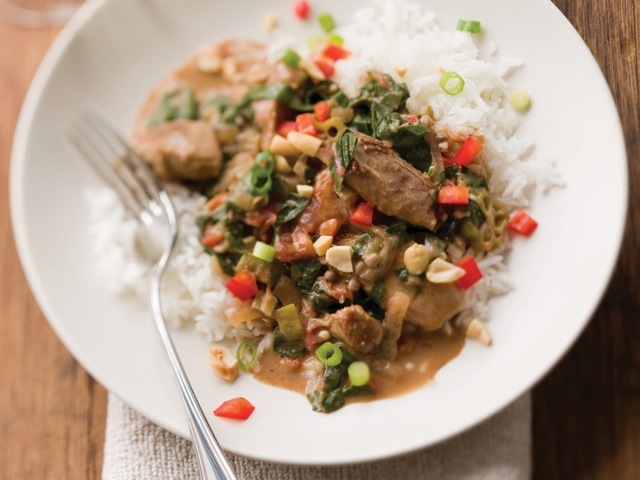 In Africa, home cooking means hearty stews served over rice or mashed root vegetables. Peanuts, known as groundnuts there, lend flavor and texture to our version of a traditional West African recipe. Okra, another staple in African cuisine, does what it does best, thickening the liquid as it simmers in the broth with tomatoes and vitamin- and iron-rich Swiss chard. Creating a vegetarian version of this stew is simple: Switch to vegetable broth and omit the turkey, adding chunks of tofu or cooked beans (such as kidney) for meaty texture. Heat 1 tablespoon of the vegetable oil in a large Dutch oven over medium-high heat. Add the turkey and cook for about 5 minutes, just until the meat is lightly browned. Transfer the meat and juices to a plate. Add the water and deglaze the pot, scraping up the bits from the bottom. Pour the liquid and bits over the reserved turkey. Reduce the heat to medium and add the remaining tablespoon oil to the pot. Add the okra and sauté for about 5 minutes, until a shiny, sticky film forms. Add the onion and cook for an additional 5 minutes. Pour in ½ cup of the stock and deglaze the bottom of the pot. Add the garlic and cook for about 30 seconds, just until fragrant. Stir in the cayenne, garam masala, tomatoes, peanut butter, reserved turkey and juices, remaining stock, and chard. Simmer over medium-low heat for 45 minutes. Taste for seasoning and adjust as needed. Serve the stew over hot cooked rice and sprinkle with the red bell pepper, peanuts, and scallions. Garam masala is a North Indian blend of spices; it usually includes cinnamon, cloves, cumin, cardamom, nutmeg, black pepper, and chiles. It can be found at specialty shops and some supermarkets. It’s true that most commercially sold curry powders are also a blend of spices, but garam masala’s constituents make for a different flavor profile. So while this recipe would still be delicious using curry powder as a substitute for garam masala, it wouldn’t be quite the same.